Pairing typefaces is known as one of the great challenges in typography. While it can involve the gathering of two or more types of different styles, mixing types of the same style is perhaps considered the supreme discipline. Accomplishing the art of mixing typefaces without creating discordance or even committing a cardinal error takes much practice and eventually experience. However, there are a few guidelines and simple facts to watch out for. You don’t have to be a fortuneteller to recognize that a sans and a serif of the same super family will go together; they were designed to complement each other. Luc(as) de Groot’s dream team The Serif and The Sans of the infamous Thesis family, Martin Majoor’s pair FF Scala® and FF Scala Serif® as well as Erik Spiekermann’s sisterly couples FF Meta® and FF Meta Serif® as well as FF Unit® and FF Unit Slab® are popular and often-used examples. And even if designing them for each other was not the initial idea, typefaces of the same designer are usually a good match. 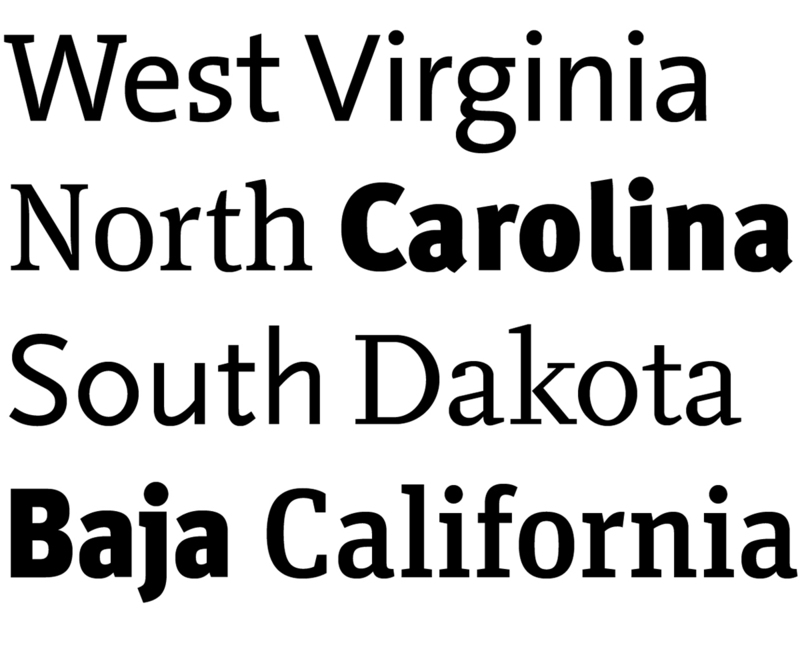 Accordingly FF Meta Serif® may be mixed with FF Unit® and their counterparts respectively. Eric Gill designed Gill Sans® and Joanna® in strong resemblance to each other, without initially planning a type family – no doubt about their compatibility whatsoever. * More tips about these so-called type systems can be found here. Without planning a type family initially, Eric Gill designed his Gill Sans and Joanna in strong resemblance to one another. If you’ve done your homework, you will be familiar with the famous “Noordzij cube”. 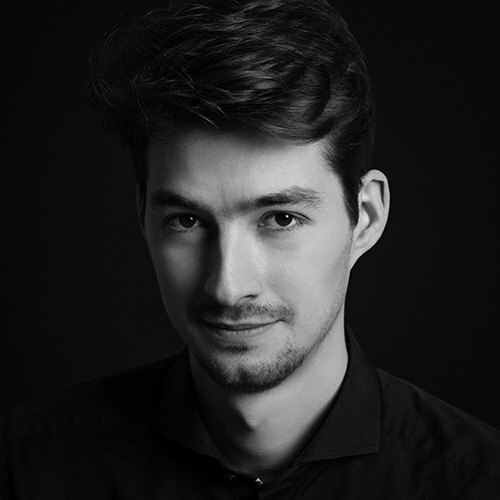 To type designers Gerrit Noordzij’s diagram displays the possibilities and relevancies of contrast in a design process, while it can be used as a reference of styles to typographers. The letters sitting on the opposite vertical ends may vary in contrast and in style, but they preserve similar skeletons. Classics such as Bodoni and the grotesque Helvetica feature ‘closed’ shapes, while the humanists Garamond and Frutiger are much more ‘open’ – thus the pairs are compatible respectively. 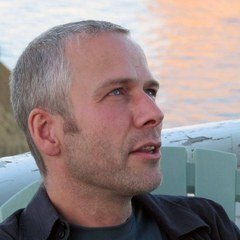 Similarly Martin Majoor has argued how well Walbaum (a modern style typeface of the early nineteenth century, but much warmer than Bodoni or Didot) and Akzidenz Grotesk (a “grotesque” not as static as Helvetica or Univers) go together well, based on the letterform characteristics they share. ** One is a serif while the other is a sans; Mutual understanding can be possible by means of similar shapes, often based on historical models. Watch out for closed and open letter shapes and whether a line of text is to be dynamic or static. In fact it is very helpful to know about type classification models. 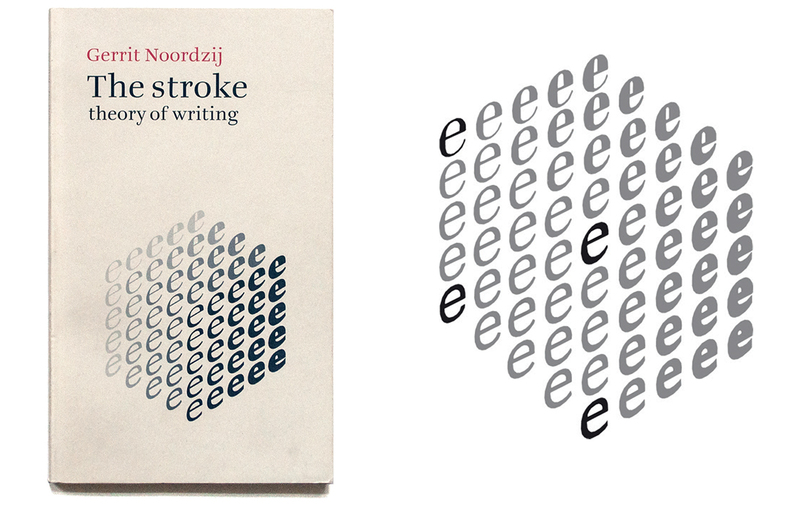 Cube diagram by Gerrit Noorzij on the cover of his famous book ‘The Stroke, theory of writing’ (published with Hyphen Press in 2005). The corners have been emphasised to illustrate the point made in this article. Mixing sans and serif with their own kind is not easy – this pair has to be chosen carefully. Hans Rudolph Bosshardt set an example by demonstrating the compatibility of Akzidenz Grotesk with FF Meta and Irma Boom dared to mix Univers with Frutiger, Gill Sans et al in the 1987/1988 yearbook of the Dutch Postal Service. She later admitted that this was the result of “honest naiveté and courage”, but you surely wouldn’t find her choice of line spacing in a typography manual either. *** This simply proves that there are no limits and mismatching typefaces is a concept of its own after all. 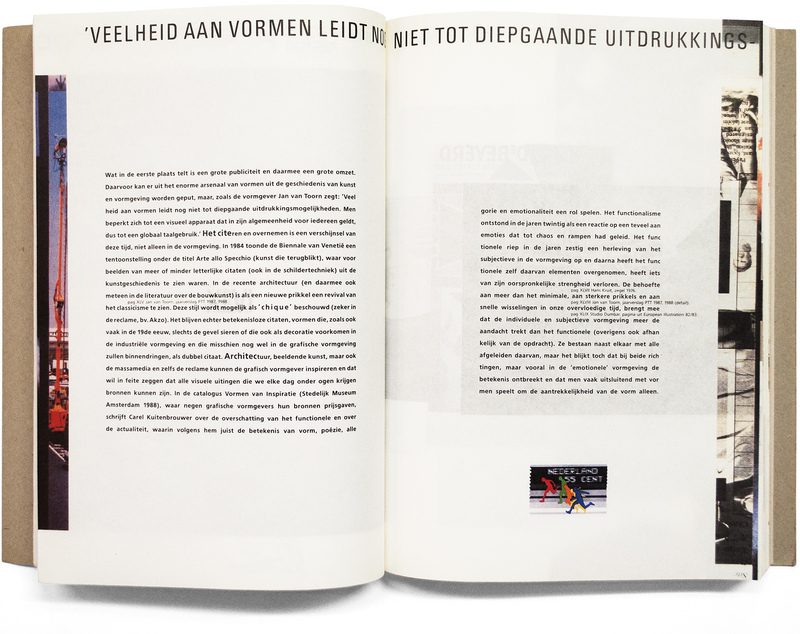 For the 1987/1988 yearbook of the Dutch Postal Service, Irma Boom chose to combine Univers with Frutiger – a rather odd combination, but not impossible. Later in the book Gill Sans joins the Frutiger duo. Mixing serifs requires much skill, but then again you can trust the dictum of contrast. Lyon and Stempel Garamond won’t harmonise, because they share the same values – they are just too close and yet not close enough. Possibly a high-contrast typeface like Bauer Bodoni can get along with a mono-linear slab serif like Memphis. They have experienced different historic development – at the same time they feature similar ‘closed’ and static shapes. Italics of serif faces can under circumstances be treated as a style of their own. They have undergone a separate historic development, apart from their non-italic counterparts, and therefore can be mixed with a different upright typeface. The text version of Lyon and Stempel Garamond are to close, they share the same background and yet they slightly differ in stroke width and and contrast – not a good match. Bauer Bodoni has a high stroke contrast, Stempel Memphis has nearly none. However, the two approach each other with a static and ‘closed’ structure – an interesting fit. Ultimately, when you have found two typefaces that you feel make a great pair, there is one more detail to watch out for: Even though your selection is in harmony by contrast, stylistically or by any other characteristic, it can easily fall into discordance, when the sizes mismatch just slightly. Either use them in distinctly different sizes or match them perfectly. Lengthly descenders, ascenders or the cap height-x-height-ratio can make the same sizes in your application look quite apart. The optical trick is to match the x-heights. There are digital plug-ins to mathematically achieve perfectly matching x-heights out there, but don’t forget: This is an optical issue – trust your eyes! * Check out David Sudweek’s review of Joanna Nova and Gill Sans Nova. 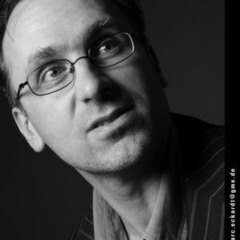 ** Read more about Martin Majoor’s theories and his type design philosophy here. The image in the header is a letterpress poster designed by Thomas Maier and printed by Kurt Gradwohl from original wood type in Graz, 2015. FF Scala, FF Scala Sans, FF Meta, FF Meta Serif, FF Unit, FF Unit Slab, Gill Sans and Joanna are trademarks of Monotype GmbH and may be registered in certain jurisdictions. FontFont and FF are trademarks of Monotype GmbH registered in the U.S. Patent and Trademark Office and may be registered in certain other jurisdictions. All other trademarks are property of their respective owners.